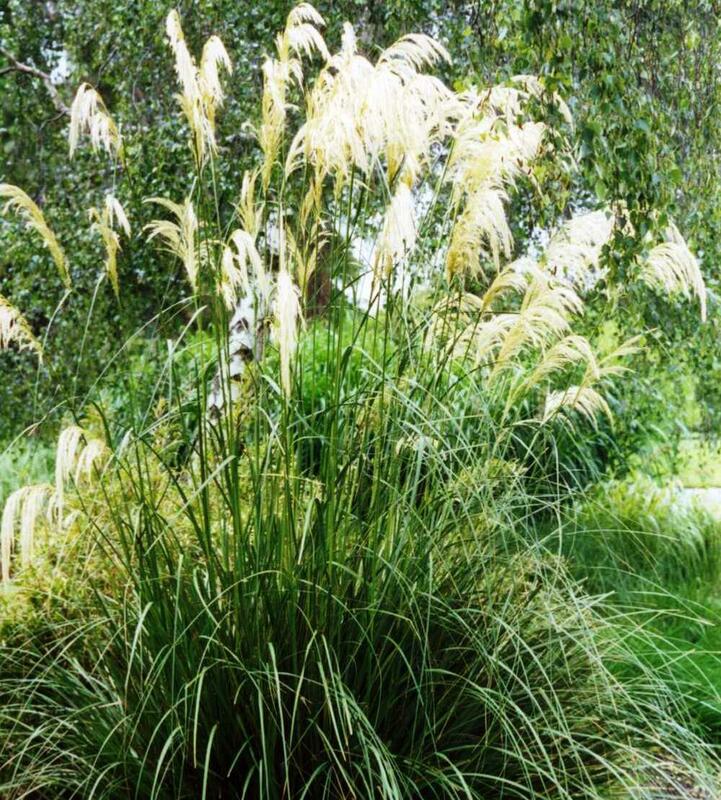 Austroderia richardii are large sized grasses that can grow to around1.5 to 2m tall. Its leaves are yellowish green, sharp edged from 1m long and around 2 to 5cm wide. The flowers are the main identifying feature of Austroderia richardii as they have great arching, dense, silvery plumes at the top of the hollow stems which makes them very elegant and stand out. The 2.5m high flowerhead is always one-sided and drooping; unlike the true Pampas Grasses, and the head has many fine hanging branches which contain numerous small clusters of flowers encased in soft, hairy scales. The clumps appear to be a buff to yellowish colour and grow to around 1.5m tall and have a loose architectural open appearance. Austroderia (Cortaderia) richardii is one of 5 species in the genus Austroderia that are endemic to New Zealand. It occurs mainly in the South Island and is also an introduced species in Tasmania and Australia. 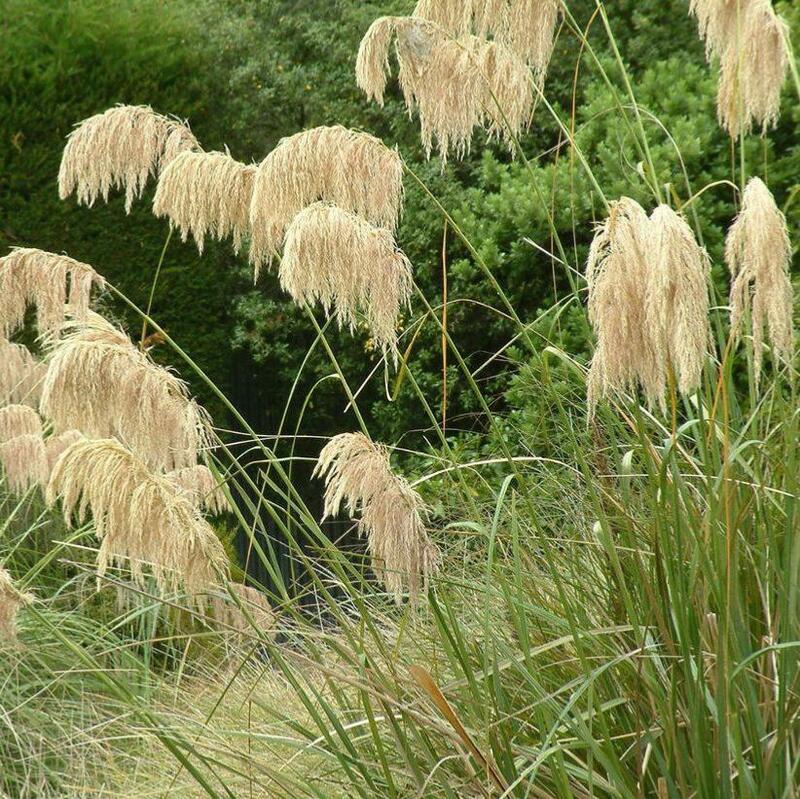 They were recently reclassified in 2011 from the Cortaderia genus, although their distinctiveness had been recognized as early as 1853. It is an evergreen perennial grass, widely cultivated in temperate regions for its plumes of silvery white inflorescences that appear in summer and last until well into winter, and grow to 60cm (24in). Like its relatives it is much used in dried flower arrangements. It has gained the Royal Horticultural Society's Award of Garden Merit.